Tasha Tudor was one of America’s best-known and beloved illustrators. Her first little story, Pumpkin Moonshine, was published in 1938. She illustrated nearly 100 books and received many awards and honors, including Caldecott Honors for Mother Goose and 1 is One. Many of her books were translated into foreign languages and distributed around the world. Tasha moved to Vermont in the 1970s and lived among period antiques, using them in her daily life. 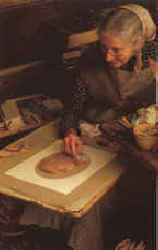 She was adept at crafts such as candle dipping, weaving, soap making, doll making and knitting. Tasha Tudor is currently considered a "single author." If one or more works are by a distinct, homonymous authors, go ahead and split the author. Tasha Tudor is composed of 21 names. You can examine and separate out names.